Posted on January 5th, 2011 at 5:02 pm. It has been a horrible start to a new year for the safety of people walking on the streets of Portland. In the past 24 hours, two people have been hit (one of them killed by a hit-and-run driver) while attempting to cross SE Division Street. SE Division street as it appears on PBOT’s High Crash Corridors map. The dots represent crashes recorded between 1999 and 2008. Larger dots represent multiple crashes. Posted on October 22nd, 2010 at 2:13 pm. improved safety. Will they follow it? 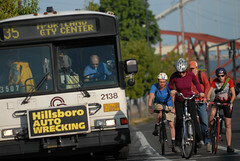 On Wednesday, the TriMet Task Force on Safety and Service Excellence released its final list of recommendations. The task force was put together following a tragic incident back in April where a TriMet bus operator drove into five people in a crosswalk in downtown Portland, killing two of them. Posted on October 6th, 2010 at 1:02 pm. Setting sun on N. Killingsworth. Posted on August 26th, 2010 at 11:21 am. people when a bus is turning. In an effort to improve the safety of people walking and bicycling around their buses, TriMet is considering the use of a new product that would emit LED lights and short bursts of sound when a bus makes a turn. Posted on June 30th, 2010 at 10:14 am. Posted on February 18th, 2010 at 10:18 am. Mayor Adams addresses the crowd. 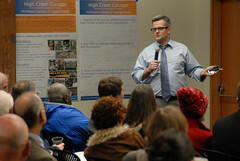 Mayor Sam Adams hosted the Transportation Safety Summit at U of O’s White Stag Building in downtown Portland Tuesday night and a standing-room only crowd of over 200 citizens, advocates and city and state officials showed up. Posted on February 16th, 2010 at 9:40 am. 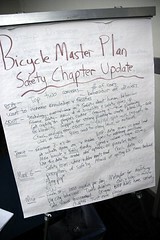 of the 2030 Bike Plan. 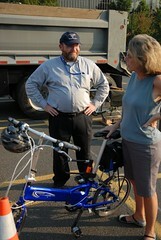 Tonight from 6:30-8:30pm at the White Stag Building (70 NW Couch St) is the 4th Annual Transportation Safety Summit. Hosted by Mayor Sam Adams, this event will be an excellent opportunity to learn and to share your insights and concerns with the leaders of PBOT, ODOT, the Portland Police Bureau, and others. Posted on June 3rd, 2009 at 10:05 am. Shaff at last year’s event. 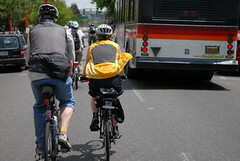 Continuing a campaign they began last year, the City of Portland’s Water Bureau will hold a bike/truck safety event this Saturday. The Water Bureau says this ongoing effort to improve safety was prompted by a number of near collisions over the years (mostly at the infamous NE Broadway and NE Flint Street intersection, which is close to one of their facilities). Posted on May 20th, 2009 at 11:04 am. 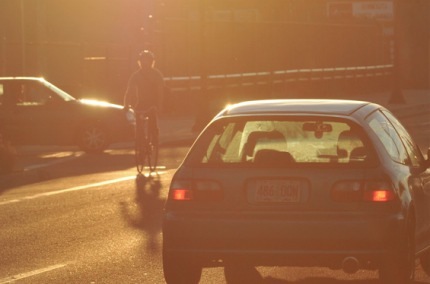 Came across an article on bike safety published to the official blog of the U.S. Department of Transportation this morning (which is unfortunately called “Welcome to the Fast Lane”). 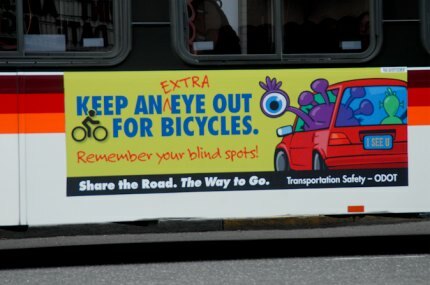 Since May is National Bike Month, the US DOT found it fitting to remind folks on both sides of the windshield that safety should be the top priority. A blog post about bike safety isn’t usually news, but when it comes from the US DOT I think it’s worth noting how they approach the topic. The basic gist of the article is, ‘hey, we all know bikes are great, but this new push get more people on them will only work out if people don’t run into each other’. Posted on April 3rd, 2009 at 4:15 pm.